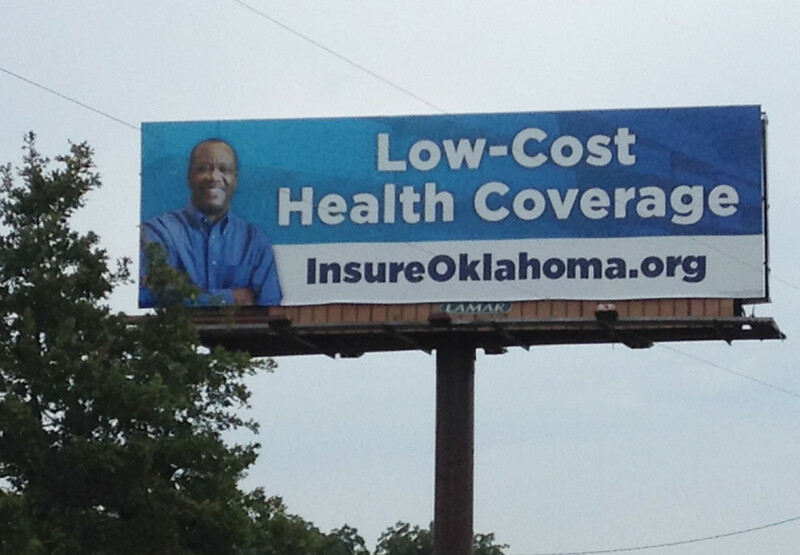 A state marketing campaign for Insure Oklahoma includes six billboards along interstate highways. Updated Sept. 21, 2015, to include latest expansion of Insure Oklahoma program. The social media blitz started in late July. The radio and TV spots showed up in mid-August, along with six billboards placed along key interstate highways. A sleeker website will be unveiled soon. The message: Insure Oklahoma is still open for business, and ready to grow. The $450,000 marketing campaign came after five years of steady shrinkage in the 10-year-old, tax-supported health insurance program for Oklahoma’s working poor. It was accompanied in late September by a program expansion that opened Insure Oklahoma to a new group of businesses, those with 100 to 250 employees. In a state that refused to accept federal money to expand Medicaid, some officials say Insure Oklahoma is the best available option to cover more of the uninsured. The marketing campaign and program expansion were launched to reverse a decline that began about the same time as congressional debate and enactment of the Affordable Care Act in 2010. 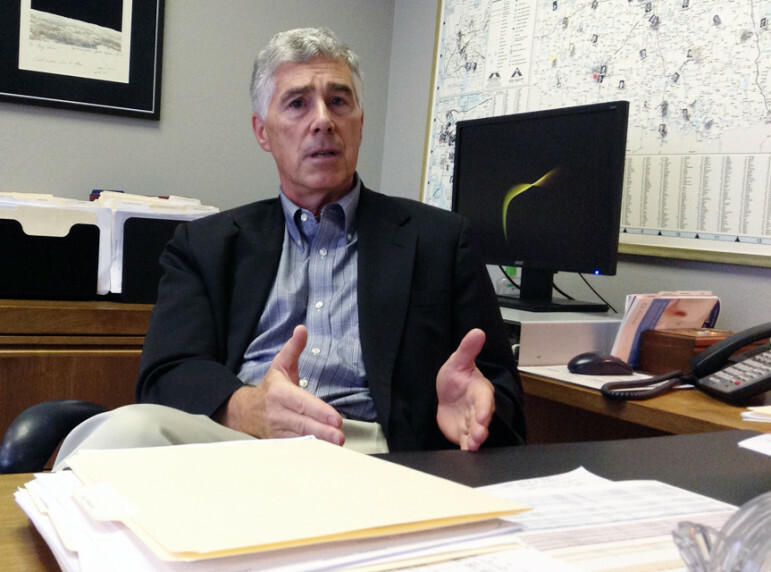 “That was a game-changer,” said Nico Gomez, CEO of the Oklahoma Health Care Authority. Businesses became wary of staying in or signing up for a state program that kept being extended a year at a time, while state and federal officials were in a political standoff over health care policy, he said. Even today, Insure Oklahoma is operating under an extension that will expire at the end of next year. “They (businesses) did not want to get involved in a program and provide a benefit to their employees that they would then have to take away,” Gomez said. The number of small businesses participating in the program has fallen by 35 percent over five years. The number of people covered has dropped by 47 percent over a four-year period. About 7,000 people dropped off the rolls on Jan. 1, 2014, when the state lowered the income limit for individuals who can receive subsidized coverage through Insure Oklahoma. But that accounted for less than half of the total shrinkage, data shows. 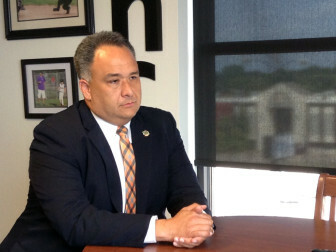 Nico Gomez, CEO of the Oklahoma Health Care Authority. The Health Care Authority, which administers the program, essentially shut down its marketing and recruitment efforts when the Affordable Care Act was passed in 2010. Gomez said he decided to crank it back up this year because he’s convinced Insure Oklahoma is the most viable platform to expand health care coverage in the state. Such an expansion faces challenges. Among them is an unresolved impasse between Gov. Mary Fallin’s office and the Obama administration over Oklahoma’s refusal to go along with a proposed expansion of the state’s Medicaid program, called SoonerCare. “There are federal dollars available to expand Medicaid. Our state is not interested in doing that,” said Craig Jones, president of the Oklahoma Hospital Association. “‘Obamacare’ is just a toxic term in the current political environment.” – Craig Jones, president, Oklahoma Hospital Association. In its current form, Insure Oklahoma provides subsidized health insurance to working people earning as much as 200 percent of the federal poverty level. Those who receive policies through participating employers pay 15 percent of the premium cost. The employer pays 25 percent, the state pays 23 percent and the federal government covers the remaining 37 percent. The program had been open to employees of businesses with fewer than 100 workers as well as some self-employed people, disabled people and students. Unemployed people also qualify under some circumstances. On Sept. 21, Fallin and Gomez announced that Insure Oklahoma was being expanded to include businesses with 100 to 250 employees, effective immediately. The expansion increases the odds that the program can reverse its membership decline. Gomez acknowledged, though, that Insure Oklahoma’s maximum capacity was still limited to about 30,000 people. “Right now we only have about 17,000 Oklahomans participating. We actually have room to serve another 13,000 to 15,000 Oklahomans,” he said. Moving beyond that would require legislative changes to provide more state revenue and a negotiated agreement with the federal government to obtain more federal funds. The program’s Sept. 15 headcount includes 13,117 workers, spouses, students and other dependents enrolled in the employer-sponsored plan, and 3,981 people enrolled in the individual plan. The state’s contribution comes entirely from tobacco tax revenue. Because that funding pool is limited, Insure Oklahoma could accommodate about double the current enrollment before it ran out of state money. It’s not clear how long the federal government might continue offering one-year extensions of Insure Oklahoma. The latest one will expire Dec. 31, 2016. A new president will take office in early 2017, and the Affordable Care Act might undergo significant changes at the hands of Congress. But it’s only a fraction of Oklahoma’s low-income uninsured population. About 104,000 Oklahomans are in a “coverage crater” caused by Oklahoma’s rejection of the Obama administration’s Medicaid expansion proposal, according to recent estimates by the Henry J. Kaiser Family Foundation. The Oklahoma Hospital Association estimates that as many as 200,000 Oklahomans could obtain health coverage if Insure Oklahoma were expanded. That would require passing legislation to broaden eligibility criteria and striking a deal with the federal government to use funds originally intended for Medicaid expansion. The Oklahoma Health Care Authority has released two television spots promoting Insure Oklahoma. Teresa Meinders Burkett, a Tulsa health care attorney who is encouraging state officials to strike such a bargain, says the state is losing about $2 million a day by rejecting federal funds available for Medicaid expansion, including state-based alternatives. Burkett noted that the state of Arkansas obtained federal approval to use Medicaid expansion money to finance a state-operated program that is similar in many respects to Insure Oklahoma. Later in 2013, a private consulting firm hired by the state recommended that Oklahoma develop an alternative to Medicaid expansion, using Insure Oklahoma as the platform. The plan proposed by Leavitt Partners was not adopted. The governor’s office said in a statement Thursday that an expansion of Insure Oklahoma was something the Legislature could consider in 2016. State Rep. Doug Cox, R-Grove, chairman of the Conference Committee on Public Health, said discussions are under way that could lead to an expansion of Insure Oklahoma. Craig Jones, president of the Oklahoma Hospital Association. Hospital Association President Jones said his organization sees Insure Oklahoma as the best bet to expand access to affordable health care for uninsured Oklahomans. “’Obamacare’ … is just a toxic term in the current political environment,” Jones said. Oklahomans who purchase health insurance policies next year from the leading insurer in the Affordable Care Act marketplace could face unsubsidized rate increases averaging 31 percent.